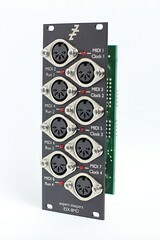 We’re happy to announce the ESX-8MD mk2, an updated version of the MIDI/DINsync expander for the ES-40/ES-5. 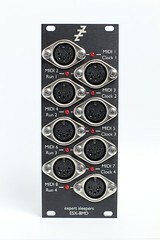 Whereas the original ESX-8MD was sometimes incompatible with certain MIDI devices when running at a 44.1kHz sample rate, the mk2 is guaranteed to operate with all MIDI devices, at all sample rates. The ESX-8MD mk2 is expected to be available in December 2014. Pricing unchanged.